It all began on Saturday, June 18th, 2005. That day happened to be the hottest so far during the summer. Even as the sun went down, the scorching heat remained. With not a space to be found anywhere, young fans were dropping like flies in the sultry weather. Fans had begun to pack the arena from noon. The air was heavy with anticipation. Support from the British band Hard-Fi, Long Island screamo group Taking Back Sunday and Arizona foursome Jimmy Eat World was not enough to satisfy - the crowd wanted Green Day. The PA system struck up the YMCA, heralding the entrance of the infamous pink bunny rabbit to keep the crowd entertained. Finally, Green Day emerged...and their army of fans were welcomed to paradise. The gig itself was a little different than the set already witnessed in the UK during the tour. The difference was, now Green Day had 65,000 fans cheering them on. An opening thrash of American Idiot, followed by nine-minute masterpiece Jesus of Suburbia and political piece Holiday. No other band could possibly belt out lyrics such as "Zieg Heil to the president gas-man! ", and still maintain their credibility. Plenty of old favorites were also executed, Hitchin’ a Ride, Minority and Basket Case to name a few. But the real attention was focused on Knowledge, the Operation Ivy cover Green Day has been performing since the early days. 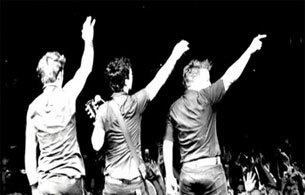 This is the one part of Green Day's show which really sets them apart from other bands; handpicking three youngsters from the crowd to have that once-in-a lifetime opportunity of playing Green Day's instruments. No matter how outrageous, outlandish or otherwise Green Day's onstage antics are, what happens during Knowledge is magical. Two hours later, and to the dismay of the crowd, Green Day's set comes to an end. The finale is one of simple brilliance: front man Billie Joe Armstrong positions himself at the end of the walkway with nothing but his guitar for an emotional rendition of Good Riddance (Time of Your Life). It has been a day of triumph for Green Day...In 16 years the band has gone from playing in dark, dirty clubs in Berkeley to putting on a show for the masses. Throughout the weekend, director Sam Bayer hovered collecting footage to be used as part of the Bullet in a Bible DVD. But every good thing must come to an end, and on Sunday, June 19th, it did. During those two days, two days of sunshine, sweat, music and drama, Green Day had proven for the entire world to see that they are a force to be reckoned with. Messrs Armstrong, Dirnt and Cool played the shows of their lives on British soil, and what a success it was. Thirst, sunburn and a long journey home faced many of the fans leaving the bowl. It was all worth it, in the end.